Produktinformationen "Corksport Ansaugbrücke Mazda 3 & 6 MPS"
Introducing the long-awaited CorkSport Intake Manifold for the DISI-MZR engine found in the Mazdaspeed 3 and Mazdaspeed 6. First impressions will quickly tell you this is a very different design and design goal than typically found in the performance aftermarket options for the MS3 and MS6; that’s for good reason. The CorkSport Intake Manifold is a combination of performance and OE fitment without compromise. Equal flow, higher flow, tighter packaging, and TMIC fitment are aspects that define the CorkSport Intake Manifold. We know modifying additional components to install a new performance part can be a real PITA; we worked hard to design a performance intake manifold that does not require extensive modification to use. The CS IM installs nearly identical to an OE IM plus difficult to access hardware locations on the flange have been clearanced for improved installation. The CorkSport Intake Manifold may fit like OE, but that’s where the similarities end. The CS IM is designed with performance and drive-ability in mind with the larger plenum design and long even flow cylinder runners. The intake plenum is ~3x larger than OE which improves high RPM power capacity without sacrificing throttle response and drive-ability. The cylinder runners are longer than the typical aftermarket intake manifold to improve mid-range power while still having peak RPM capacity with the single runner design vs the OE split runner. Balanced flow is critical to the durability and performance of an engine; this is why the Intake Manifold is such a valuable performance component for the Mazdaspeed engine. The OE Intake Manifold has significant flow imbalance between the 4 cylinders which causes cylinders to run excessively lean or rich, affecting engine durability and performance. Check out the graph to see the difference. Not only does the CS Mazdaspeed Intake Manifold outflow the OE design by 70CFM on average, but also significantly reduces the flow imbalance to 2% or less vs the OE imbalance of 21%. This means your engine can run stronger longer and have a higher potential to make power. 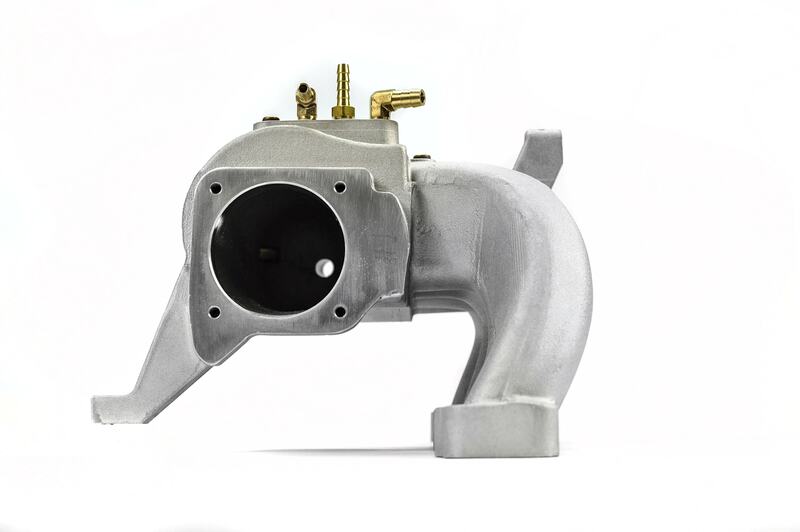 The increased flow capacity and even flow between the cylinders provided by the CorkSport Intake manifold help increase power across the entire RPM range and spool the turbo ~100 RPM faster than OE. The graph to the right shows the difference in power before and after the CS IM on a MS3 with the CorkSport TD05H-18G turbo equipped. The horsepower spike around 3300rpm is a result from a combination of the CS IM and a small increase in wastegate pre-load. The increased efficiency of the CS IM caused a 2-3psi drop in boost pressure that had to be corrected with the wastegate preload. But wait there’s more! Along with the overall design improvement over OE; there are additional design features that you need to know about! 1. First off is the larger throttle body opening measuring at 70mm vs the OE 60mm. This works great with the OE throttle body and also allows the use of a larger throttle body without modification if desired. 2. Second are the additional fueling ports located on each runner. These are standard 1/8-27 NPT threaded ports that can be used with methanol nozzles or other fueling options. 3. Lastly there is an additional 1/8-27 NPT vacuum/boost port for gauges, controllers, etc. 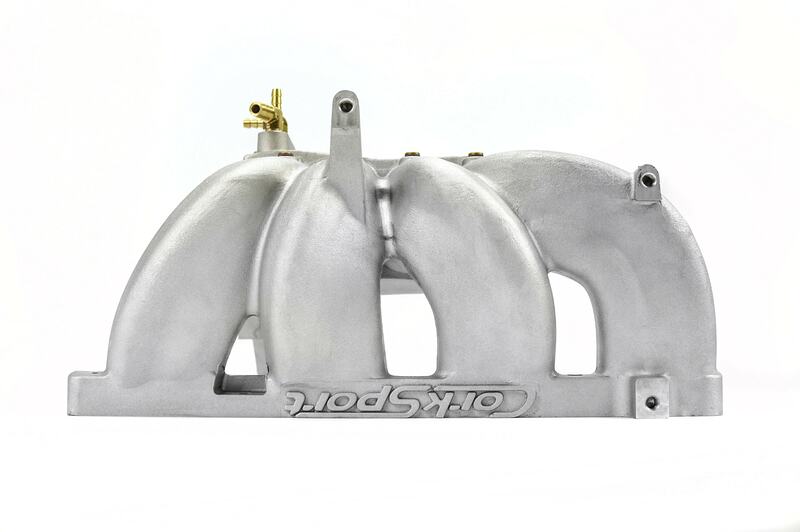 The CorkSport Mazdaspeed3 Intake Manifold / Mazdaspeed6 Intake Manifold is for off-road and racing applications only. 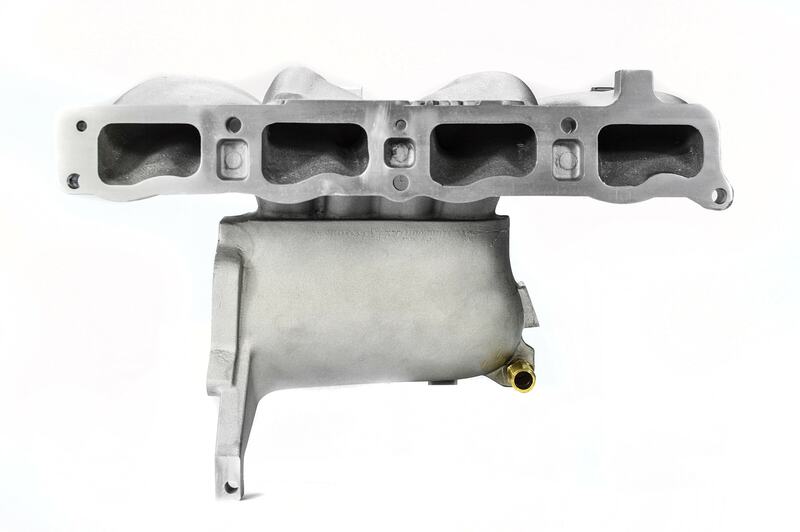 EGR Block-Off Plate: The CorkSport Intake Manifold does not retain the EGR recirculation port. An EGR block off plate is required for installation. VTCS: The CorkSport Intake Manifold does not retain the provisions for the VTCS system. 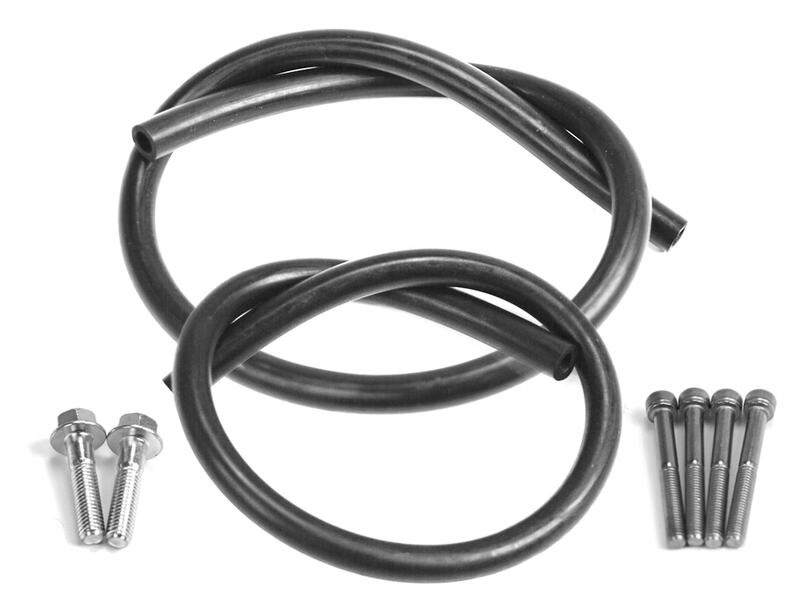 Gaskets Not Included: OE throttle body and cylinder head gaskets are not included in the kit. OE gaskets will work correctly with the CS IM. Due to the difficulty of the manufacturing process, no intake manifold is identical or perfect in reference to the casting. Dimensionally and performance-wise, the intake manifold will perform as advertised. Every intake manifold is inspected for quality assurance. However, if any customer is unhappy with the aesthetic/look of the part, call us before installation and we’ll be happy to take care of you. 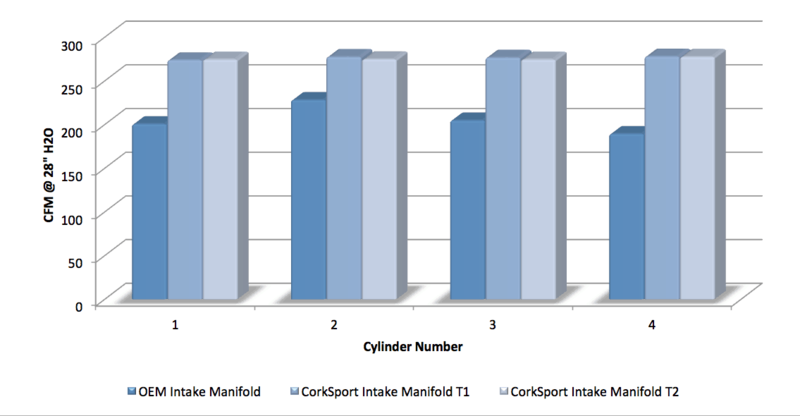 Tuning: the CorkSport MS3 Intake Manifold requires aftermarket tuning for proper engine performance. Weiterführende Links zu "Corksport Ansaugbrücke Mazda 3 & 6 MPS"
Kundenbewertungen für "Corksport Ansaugbrücke Mazda 3 & 6 MPS"